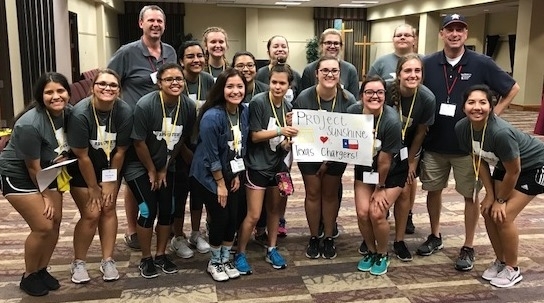 Texas Chargers are looking for volunteers for the 13th Annual Texas Chargers Retreat to be held at Camp Allen in Navasota, Texas. The dates for the 2018 conference are November 2-4, 2018. There are several areas in which you may volunteer, although our most pressing needs involve spending the day with an individual with CHARGE and/or their siblings. Individuals with CHARGE are paired one-to-one with a volunteer. Other volunteers will help with siblings, although not one-to-one. Other areas of need include staffing for the various activities throughout the day, to include an assortment of carnival games, rock wall, bounce house, petting zoo/exotic animal show, crafts, outside games, sensory room, silent auction, etc. Volunteers with infants & toddlers spend their time in a daycare setting where they play, play, and play! And of course, there will be time spent eating and sleeping as well! When it’s time for a nap, there is a “quiet room” where they can take a nap and you can have a little down time also. Parents and/or the camp nurse will always be nearby to assist with feedings and medical care. Children through young adult will spend the day sampling the scheduled activities, both inside and outside. If you have any sign language skills, we need you too! Many of the individuals with CHARGE are non-verbal and utilize sign language to communicate. Come help enrich their time here while practicing your signing skills. You will receive a camp T-shirt and also have a break for lunch to enjoy a delicious meal at the camp cafeteria. Even as good as that sounds, your most rewarding experience will be the time spent with those with CHARGE syndrome and their siblings, helping them enjoy their day while allowing their parents to recharge, network, and share the joys and challenges of raising someone with CHARGE. If your organization would like to volunteer or if you are an individual who would like to volunteer either working one on one with a child with charge syndrome or working with siblings in activities please contact Doug McLean.